I'm excited to be part of The Opulent Projects upcoming project, COSTUME COSTUME, which will be making it's debut at Sienna Gallery's booth at the NYC SOFA exhibit from April 14th through the 17th. I'm really excited to be part of such a fun and conceptual project that presents handmade, contemporary jewelry at an accessible price to young collectors. 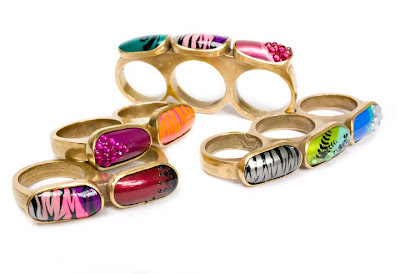 COSTUME COSTUME is a collection of work made by emerging contemporary art jewelers. It is an exploration of costume jewelry as subject, jewelry about jewelry. You'll find the COSTUME COSTUME show in the Sienna Gallery booth (#301), their installation includes a photo-booth where the guests are invited to document themselves wearing the opulent baubles that are part of the show. Participating artists as of April 2011 Mikael Arsjö, Kate Bauman, Michael Dale Bernard, Thyra Bessette, Sarah Kate Burges, Erin Gardner, Anna Hinkes, Rory Hooper, Courtney Kemp, Julia Elizabeth Louise, Jimin Park, Mary Hallam Pearse, Earl Ross, Leslie Skalin, Theresa Sterner, Monika Strasser, Kristi Sword, Islay Taylor, Melissa Tolar, Ben Ulsh. Organized by Erin Gardner from The Opulent Project.